wow, that is some tree! That tree is gorgeous and I agree with the sentiments. It seems it takes months of prep work and in a matter of hours it is over. How sad in a way. Oh well, 364 days till next Christmas. Happy New Year! What a spectacular tree! The rest of the setting is lovely as well. WOW! What a breathtaking tree! Wow, what a different & stunning tree! Great shot. That is quite a tree!! Have a wonderful New Year's Eve. I cleaned up the rest of the holiday decor yesterday and it is all gone and put away, but I still have the tree up. The one color look of it seems very calming to me, so I think it will stay up for a few more days. 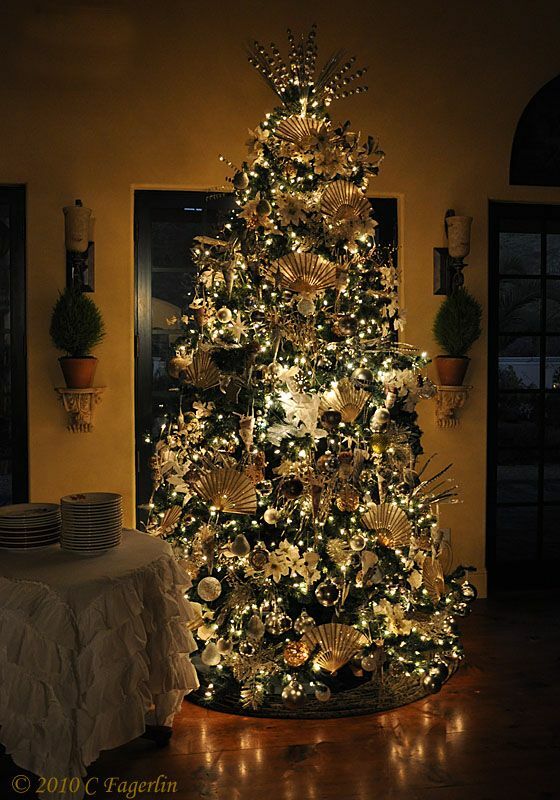 Beautiful tree, but please tell me where you got that ruffled tablecloth or if you know if it's available somewhere? On some of the other posts that show this ruffled cloth I have posted the info on where I got mine. Do a Google search for Pom Pom ruffled tablecloth.